Facsimile of the signatures of the Act of Union Act 1707. On ‘parchmentised’ paper, c 45 x 19 cms. 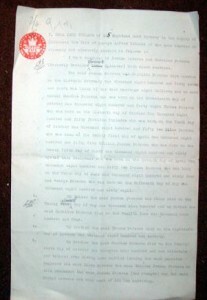 Clerk’s copy of an opinion given by William Hepburn Cozens-Hardy K.C. 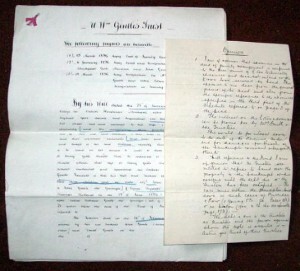 concerning an estate in Belize; also an original case to Counsel relating to the matter, 1903. 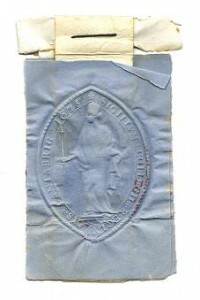 A detached seal, paper on wax, of Queen’s College Cambridge, c 7 x 10 cms. The impression is fine. The date 1675 appears in the legend, but the seal is without doubt of a later period. £6.00, including packing and postage. 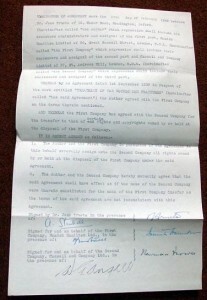 Statutory Declaration signed by Emma Jane Ireland of Hornsey, Middlesex, the daughter of Joshua Parsons, as to her her parenst and family’s immediate lineage. 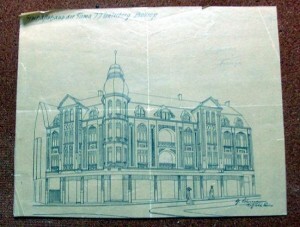 Dated 21st January 1929. On 4 pages of paper, two with text, c 21 x 33 cms. PRICE: 7.50, including packing and postage.